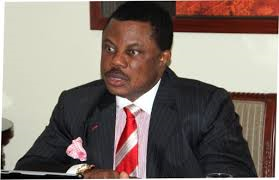 Five aspirants in the forthcoming governorship election in Anambra State have come hard on Governor Willie Obiano for allegedly playing politics in the church and declaring that there is no vacancy in the governorship seat of Anambra State. The aspirants are: Senator Andy Uba, Chief Osita Chidoka, Prince Tony Nwoye, Chief Oseloka Obaze and Chief Zeribe Ezeanuna. Obiano, while making his speech during the launch a book entitled, “Parenting in the Old Testament: Contemporary Patterns, Challenges and Solution for Nigeria” written by Anglican Bishop on the Niger, Rt. Rev. Owen Nwokolo, had said there was no vacancy in the government house in the state as he would govern for another four years. However, Senator Andy Uba, who is contesting under the All Progressives Congress, APC, told the gathering that he will disgrace the governor out of office for non performance, adding that under Obiano, the state made many steps backwards in terms of development compared to the achievements of his predecessors. Prince Nwoye, APC, who represented Chief Arthur Eze, berated Obiano for declaring that there is no vacancy at the government house, saying the governor must be shown the way out on November 18, 2017. Immediate past Aviation Minister, Chief Chidoka, who recently declared interest to contest the seat of governor of the state accused Governor Obiano of engaging in white elephant projects by laying a foundation stone of an airport project that will put the state in debt. Former Secretary to Anambra State Government in Peter Obi’s administration, Chief Oseloka Obaze, who is aspiring to contest under the Peoples Democratic Party, PDP, said he does not play politics in the church and told the people that at an appropriate time, the governor will know if he is popular and accepted by the people.